I am slowly unpacking things from my storage unit and into my new apartment. I love going through my things I have not seen in about a year and a half. My things were packed up in August 2013 and been bouncing around from storage unit to storage unit. I feel so accomplished by finally finding a place to settle for a bit. But the unpacking is like going into a drunken vault of my old life. My old flask. A beer glass I stole from a bar in India. My fancy wine cork opener. My fancy wine stoppers. My mixer. My cocktail recipe book. The little drink mixing tool set that I got at a thrift store and never really knew how to use. My shot glasses. My wine glasses. My beer mugs I used to keep in the freezer to stay frosty. A wine tasting guide I picked up in Napa. 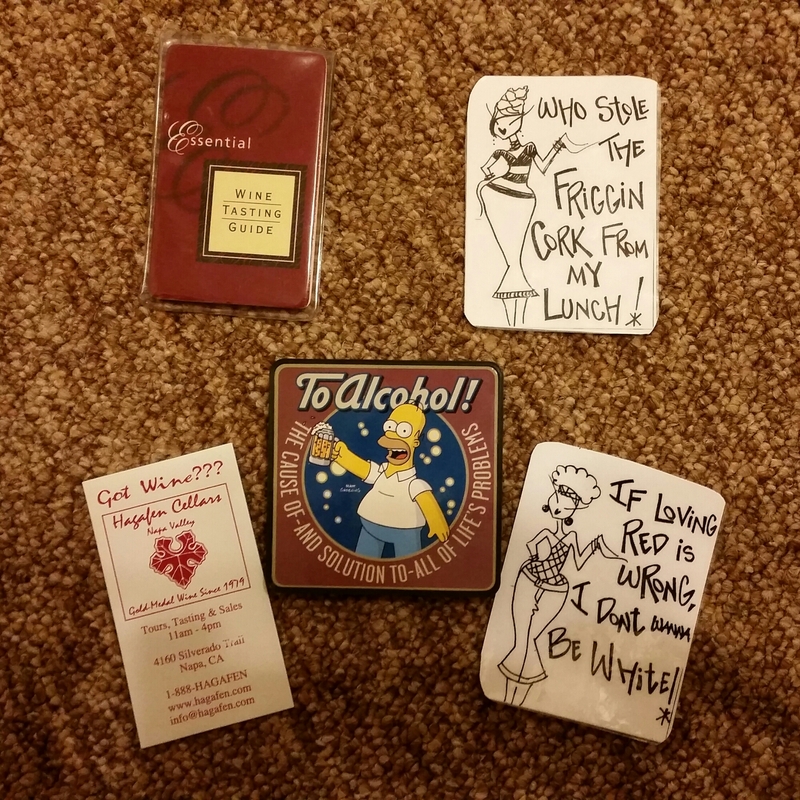 These magnets that I proudly displayed to show how much I loved alcohol. I guess it feels like going through a loved ones belongings after they died. I mourn it but I know I must move on. In the past, I would have found some friends to take each of these items. But I think I am going to destroy most of these. (I will keep the glasses cause they have other uses.) Maybe I will do it ceremoniously. Maybe I will do it when I get my one year coin. I told my sister about the problems I had getting tokens in my area. She suggested I come to her city for my 1 year token. She collected hers a few months ago. I actually like that idea. It will be nice to have family or a friend there that day. Then maybe we could burn the things from my drunk vault in celebration. I think you should give them away to your friends that still drink. Put them in a box, and each time you need to give a gift, you can re-gift a memento from your past life. It will mean something to you to give your old treasures to a good friend, and hopefully they will take it in the spirit it is given. I think it depends who I give it to. Maybe the friends that have been most supportive? I already decided to give the Homer magnet to my beer-loving brother. But the two handmade wine ones and Napa winery one might still be burned as a ceremonious thing.